Eight years ago, Virginia, a municipal councillor of Chuquisaca - Bolivia, resigned from her position after fourteen hours of being locked up and threatened. At that time, harassment and political violence was largely invisible and enjoyed impunity. Today, things have changed. In 2018, Mary Carmen de la Cruz; a municipal councillor of La Paz, was able to take legal action against the mayor of Achocalla - a neighbouring municipality - for physical and verbal aggression, without losing the right to retain her municipal seat. 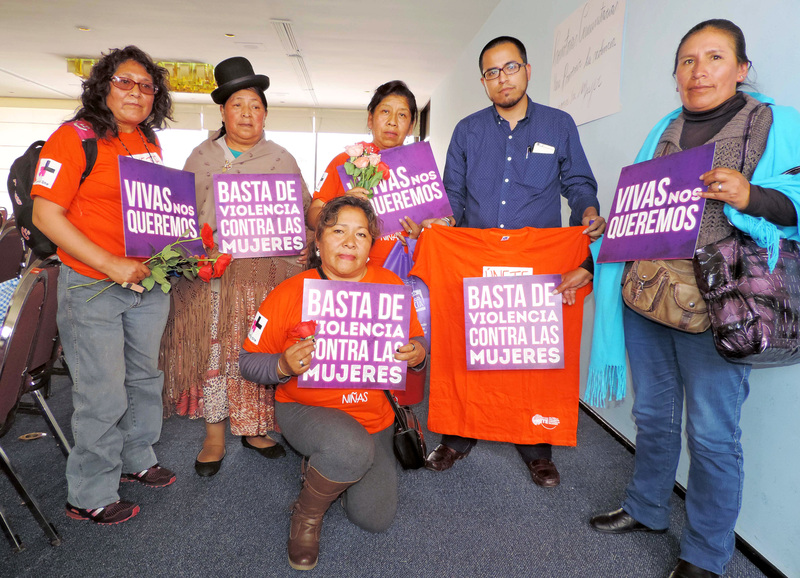 Bolivia is the first country in Latin America to criminalise political violence and harassment against women with Law 243. Legislative measures are not, however, enough for the enforcement of women's rights. It is imperative to fight against threats and impunity, but more importantly, against the invisible violence and harassment against women in politics - spaces commonly thought only for men. In this framework, the Gender Unit of the Plurinational Electoral Body created the Gender Equality Observatory (GEO) with the technical assistance of International IDEA and the support of countries and multilateral development aid agencies interested in the subject. This instrument has multiple purposes: knowledge management on women’s political rights; control gender equality compliance; monitoring progress and restrictions on political equality in a representative, participatory and community democracy. The GEO, launched in March 2016, depends on the Gender Unit of the Plurinational Electoral Body (PEB), which meant changing the organisation’s structure. The GEO has managed through four axes: 1) Woman’s participation and political representation; 2) Indigenous-aboriginal-peasant women’s political participation; 3) Parity democracy in political organizations and; 4) Harassment and political violence. The observatory monitors the number of women in positions of power at different levels. For example, it could be seen that in 2016, 50 per cent of deputies at the Plurinational Legislative Assembly (ALP) of Bolivia were women, while in the Senate only 44 per cent. In the Executive, of twenty Ministries, only four are led by women. At a departmental level, only 8 per cent of mayors are women but at the council level, this number rises to 51 per cent. By 2018, 30 per cent of Senate committees were assumed by women and 55 per cent of committee presidencies are chaired by them. Likewise, at the Commissions of the Chamber of Deputies, 29 per cent of the Assembly Members are women and in the committees, 67 per cent . With respect to the gender composition of the directives of both chambers, 33 per cent and 43 per cent are women at the Senate and at the Chamber of Deputies, respectively. It is absolutely necessary to control the exercise of parity, a right won through a prolonged and intense mobilization of women's organisations, which has placed Bolivia as the first country in Latin America to achieve parity in political representation and has generated symbolic and cultural changes in the national political system. Despite these achievements, there are still structural barriers that prevent full gender equality. That is why constant monitoring of parity movements, key development processes, trends and opportunities affecting gender equality is crucial until it becomes a daily exercise of democracy. The GEO also provides data on political violence and harassment in Bolivia. From 1 January to 18 December 2018, there were 93 complaints and 17 resignations linked to harassment and political violence throughout the country and La Paz was the department with the more cases. La Paz’s Electoral Tribunal received 36 complaints of harassment and political violence in 2018, of which 25 were referred to the Public Prosecutor's Office, 10 were rejected by this instance and 11 did not ratify the complaint. Among the types of harassment and violence, the most recurrent (61 per cent) is discrimination to fundamental rights and, in second place, 50 per cent of incidents relate to those “forced to resign from their positions” or “forced to sign a document against their will”. The third most reported type of harassment is those “prevented from attending sessions where decisions are made”. In 2.7 per cent of the cases, personal and private information is disclosed to force woman to resign. The mere fact that this data is available through the Observatory is a significant achievement as these statistics alert deviations from equal participation, parity and, harassment and political violence reduction. Remarkably, despite all the violence exerted against women in politics, 96 per cent of those who file a complaint decide not to resign. Carolina Floru’s work focuses on the implementation of Constitutional Development programmes, Representation System, Political Parties and Electoral Processes in Bolivia.